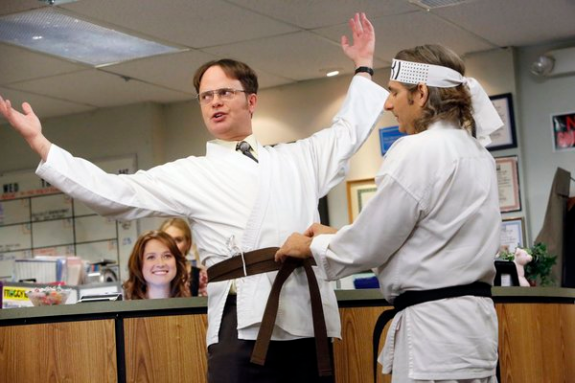 Fancy yourself as a sourcing Master Black Belt? Ready to govern your operations? Hold onto your seats everyone, but- at HfS - our ambitious enterprise clients want to achieve much more with their governance capability than simply meeting cost metrics and tactical operational targets. This why we acquired Selah Group earlier this year to launch a governance training and certification capability that today's sourcing industry is sorely lacking (see press announcement here). 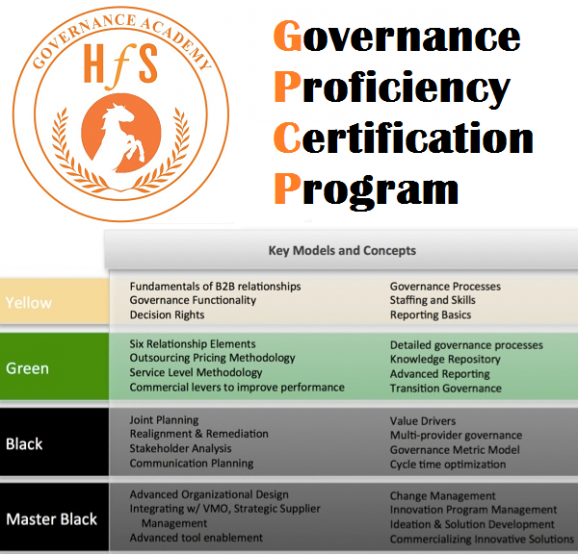 This Governance Proficiency Certification Program (GPCP) is designed to help today's sourcing executives approach service provider relationships and governance strategy with a sophisticated and pragmatic approach that will help them advance their careers, their skills and their experience. Phil Fersht, CEO, HfS Research: Good Afternoon, Mike. So you have recently come onboard HfS to take on the HfS Governance Academy. Can you just give us a quick overview on what the academy is and the key objectives? Mike Beals, Managing Director, Governance and Training, HfS Research: Well, Phil, the Academy is really an attempt to provide more structure around the governance of shared services, outsourcing and global business services environments. And the reason for it is really that most organizations, almost all large organizations, are leveraging one or all three of these different service delivery models. And there really isn’t a program or a curriculum that’s structured to provide the training and the education across the enterprise that most companies need. Phil: What do you think is unique about the training that we are providing compared to other offerings on the market? Mike: Well, I think it’s unique in a couple of respects. One of them is that it’s based on very practical experience over more than a decade working with clients. So that’s first. The second is that I think most training that’s available is somewhat ad hoc in nature. You might find a tool here or a template there. And what we have done is put together a very systematic and scalable approach to the training so that the curriculum, as you go from one concept to the next, really builds. This lets us progress students from the very basic fundamentals of governing and managing these complex relationships to very advanced concepts in a very systematic fashion. Phil: And you’ve been instrumental in developing some certifications (that we’ve just announced) that people can look at doing. Can you talk a bit about what they entail, and how applicable are they to our members? Mike: Well, the first thing we know in governing these complex environments is that not everybody needs to have the same level of proficiency. And so we wanted to have a program that started out with the fundamentals, and was generally applicable to everybody that participated in managing an external service provider, a shared service center or, a global business services environment. But then we also wanted to have higher level tiers to layer on more complex concepts, tools, and capabilities for more advanced resources. Ultimately, we patterned our Governance Proficiency Certification Program after the belt levels within Six Sigma. So we have the Yellow Belt that is generally applicable, as I mentioned, to each of those resources involved in outsourcing, shared services, GBS environments. The Green Belt is applicable to resources that are running small governance organizations or are the functional heads of larger governance organizations. We have the Black Belt that’s intended for resources that are managing multi-provider environments, very complex, or multi-geographic outsourcing relationships. And then we have the Master Black Belt which is an enterprise-level resource that looks at the overall capability of governance across the enterprise and makes sure there aren’t any gaping holes in individual teams. The Master Black Belt training also incorporates pretty sophisticated joint planning and innovation management techniques. Phil: Typically, is this going to be for individuals or entire functions/groups within organizations? Mike: Well we really look at this program at two levels. One of them is the enterprise level where we offer capability assessment tools that assess the capability/maturity of a company’s governance organizations as well as the strength of their internal and external relationships. And that assessment is very helpful in developing an overall training plan. But then we also recognize that improvement happens at the individual level. So that’s where the certification levels come in, the Yellow, Green, Black and Master Black Belt, to make sure that individuals within those teams have the right level proficiency to be successful in their role. Phil: Mike, how much effort is required from the enterprise executives to complete some of these training modules? Is it going to be very arduous? What is the process they have to go through? Mike: It is not a difficult program for a company to implement. If an organization adopts this program, we can help them quickly assess their overall governance capability and develop a training program for their individual governance teams. We use two different non-intrusive assessment surveys as the mechanism. Then it’s just a matter of scheduling the number of onsite training sessions required to get resources certified at the appropriate level. If individuals can’t attend the onsite training, we offer facilitated online web-based courses, and for those resources requiring total flexibility, we have an online, video-based course that can be taken anytime, anywhere, on a computer or any mobile device, including a smartphone or tablet with internet access and a browser. Phil: In a nutshell, Mike, once executives have been through this training, what are the three things which really improve their governance capabilities? Mike: Well, I think the program does several things for you. One thing sounds pretty simple but it creates a huge amount of value is just to have a common governance framework, vocabulary and philosophy about how you manage these different relationships across the enterprise. It helps more effectively communicate expectations and priorities internally and externally. Next, this framework, and the training that goes along with it, produces cost savings in terms of improving the understanding of the commercial methodologies and how to leverage commercial terms to get the most out of provider relationships. It results in cost avoidance in terms of better planning and communication and reduced re-work across the organization. It provides risk reduction by proactively assessing and mitigating risk. And finally it improves value creation as a result of improved joint planning, solution development, and innovation. Phil: That’s great. Thank you Mike. This is very compelling and we look forward to many of our members getting to know the programs more and seeing the first round of the certifications being completed. We really appreciate you getting this up and running and look forward to hearing the progress. Mike: Thanks Phil. It's a great opportunity to launch this program for the HfS community. HfS members can learn more about the HfS Academy and the Governance Proficiency Certification Program by visiting the HfS website.